Pictured: Newly signed BMI songwriter Ben Haggard and BMI’s Jody Williams pose for a photo in Williams’ office. BMI continues the songwriting legacy of country music’s Haggard family with the signing of songwriter Ben Haggard. 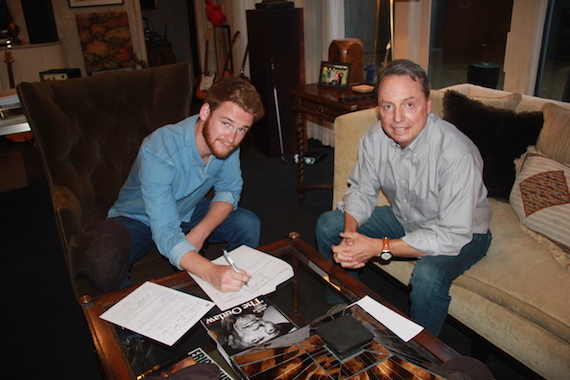 Ben Haggard, the 23-year-old son of legendary country singer-songwriter and BMI Icon recipient Merle Haggard, stopped by the BMI Nashville office on Wednesday (Aug. 31) to officially sign as a BMI writer. Ben has been on the road with his brother Noel, finishing out a slate of concerts Merle had been scheduled for before his death on April 7. Ben and Noel have opened for Willie Nelson, Jamey Johnson and the Oak Ridge Boys.